Philip Mansel's "Levant: Splendour and Catastrophe in the Mediterranean" is a remarkable, highly unusual and very readable social history of the ports of Smyrna, Beirut and Alexandria during the final decades of the Ottoman Empire. This is a remarkable, highly unusual and very readable social history of the ports of Smyrna, Beirut and Alexandria. These three great Levantine cities were cosmopolitan melting pots, as well as being points of contact between Europe and the Ottoman Empire. 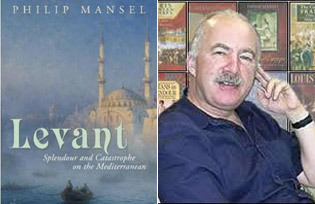 Philip Mansel has written a gripping and informative history that is part chronicle, part travel writing and part in-depth history, with a massive cast of characters ranging from Kemal Ataturk, Muhammad Ali Pasha of Egypt, Constantine Cavafy, King Farouk, and the immensely powerful foreign consuls of these three cities as well as the families of merchants and bankers who made their fortune in the Levant. The book evolves around the conflict between nationalism and cosmopolitanism. Mansel traces the roots of this conflict from as far back as the 16th century right up until the second world war. The three ports on the Mediterranean are the social laboratory he uses to ascertain if those early experiments in cosmopolitanism and multiculturalism have anything to teach us, now that the issue of peaceful coexistence between Christians and Muslims has become such a fundamental issue. In the introduction, Mansel outlines his intent: “To find out whether, as many inhabitants claimed, these cities were truly cosmopolitan, possessing that elixir of coexistence between Muslims, Christians and Jews for which the world yearns”. In the end the foreign devils were swept away in a nightmare of violence (in Smyrna) or in silent resentment (Alexandria), which does not bode well for Mansel’s investigations into multiculturalism. In Mansel’s view, the mentality of the foreign Levantines could be summed up as: “Deals before ideals….a preference for private ambition over wider aspiration”. Their modus operandi comes across as unfettered capitalism which despite having a certain wit and charm, at the end of the day simply alienated the indigenous populations – the “felaheen” in Egypt and the Turkish Muslims in the Ottoman Empire – whose resentment at this foreign encroachment and arrogance was experienced as centuries long humiliation. This is by no means a history of the failure of an ideal. It is a story of how these open cities were magnets to free spirits, clever and talented businessmen as well as writers and artists. These cities gave free rein to innovation and success, so long as one respected the cardinal rule explained by Lebanese President Chamoun to a visitor in Lebanon “Nothing is forbidden except an empty pocket, in which case nothing is forgiven”. Each city in its own way aspired to be Paris in its heyday and they each succeeded in their own fashion. Money and trade were the key elements that rode roughshod over national boundaries and considerations, but not exclusively. This was not lightning speculation: those families that moved to the Levant put down roots that lasted in some cases centuries. The various communities founded hospitals and schools and were not immune from their own nostalgia, importing the latest fashions and reading the latest books from London and Paris. They developed their own exotic hybrid culture, their own elite that combined the sturdy grimness of London with the carefree decadence of Constantinople. These families had a cosmopolitan, multi-lingual and multi-cultural identity, and in the case of Alexandria saw themselves as Alexandrines as opposed to Egyptians or Greek or British. It was life with a romantic flourish. Smyrna, Beirut and Alexandria all had one important thing in common: they looked outward to the Mediterranean and to some extent snubbed their respective hinterlands. In the case of Alexandria and Smyrna, when the cosmopolitan experiment was brought to a sudden and bloody end by nationalist forces, the countries turned inwards, enclosed upon themselves choosing Cairo and Ankara as their cultural and political centres – bringing foreign influence to a close. The key to the history of all three ports is that they were bridgeheads between East and West in a period when the Ottoman Empire was basically moribund and could be easily bullied by the great powers of Europe. The situation was anomalous: cities like Smyrna could practically override or certainly ignore the powers of the Sultan in Constantinople and manage their affairs on their own. This social flexibility attracted huge influxes of rootless people: Smyrna was populated by Turks, Greeks, Jews, Armenians, British, French, Italians and Dutch. It was a city of merchants and commercial necessity outweighed national and political considerations. The French were the first to breach the defences of the Ottoman Empire by establishing a trading post in Smyrna. They had maintained an alliance with the Ottoman Empire for centuries and in Smyrna they established a commercial centre with legal guarantees based on “Capitulations”. Trading figs and raisins back in the 17th century was just the beginning. Alexandria was the brainchild of Muhammad Ali Pasha, a fascinating character who deserves a book to himself. He dragged Alexandria into the modern world as did Peter the Great with St Petersburg. The population grew and trade flourished as merchants were given a free hand to run their affairs. Muhammad Ali Pasha was a great moderniser and organiser and, despite the occasional bloodthirsty episode, he seemed an unassuming and shrewd man who changed the face of Egypt. Beirut had a different history. There was no massive influx of foreigners but more of a forced coexistence of different religious and racial groups. The Christians in Lebanon maintained a lifeline with France that ensured a French cultural influence which offset the Arab influence from Damascus. Beirut has unquestionably been a victim of foreign influence, from the United States, Israel, Iran and of course France, but the greatest damage was wrought by the Lebanese themselves in a bloodthirsty civil war that lasted from 1975 to 1990. There was no “retaking” of Lebanon by anyone, nor a mass expulsion of foreigners, (except for the Palestinians) although the Syrians did try. Beirut (part Paris and part hell) struggled and continues to struggle with its own demons. The “elixir of coexistence” seemed to depend on the spirit of conciliation and negotiation that these cities prized so much, and a willingness to place trade over politics. It also required the threat of a firm hand, in the guise of a superpower such as the British Navy, to maintain order from the sidelines. When the superpower fell away, the killing fields were not far behind. The veneer of a relaxed environment for business and trade could never hide the volcanic tensions that eventually exploded, along racial and denominational lines. The simplistic needs of nationalism won out over the subtleties of multiculturalism. Philip Mansel appears a bit nostalgic for this beau monde of cosmopolitan high society, but his nostalgia in no way curbs his critical faculties. He is more than aware of the damage being wrought by this merchant class and new Levant elite. Their cavalier disregard for and outright snobbery towards the indigenous populations created uncontrollable resentment and anger that would eventually spill over into violence. The economic dynamism engendered by multiculturalism was not enough to keep nationalism at bay nor indeed the accumulated humiliation felt by those who gained nothing from the burgeoning economies of these cities that were in the final analysis “foreign”. The Levantines were not clever enough to engineer a trickle-down effect that would have ensured their survival. Greed was after all one of the main clichéd features of the Levantine character. Smyrna, (later to be called Izmir) was brought to a violent end by Kemal Ataturk, following an ill-planned Greek invasion of Turkey just after the First World War. The Ottoman Empire was not quite as moribund as the Greeks had presumed. Smyrna was put to the torch. In Alexandria, the high life as depicted by Lawrence Durrell and Olivia Manning, was given a rude awakening by Gemal Abdul Nasser who sent the British and other foreigners packing, after having confiscated their assets. Only Beirut managed some sense of continuity, no doubt due to the fact that essentially its disasters were wrought by its own people. Levant is a beautifully written book, full of amusing and informative gems taken from sources ranging from official documents to personal diaries. It is a history written to a human scale that depicts both the splendour and catastrophe that was the Levant. There are no doubt many historical lessons to be gleaned from the book but perhaps the one vital lesson is that what for some represent the Olympian heights of human endeavour based on coexistence and tolerance will be seen as mere greed, elitism, and injustice by others.